Navigation systems for large tunnel applications are used to advance tunnels from four metres in diameter and greater. They determine the current machine position automatically and in real time to show the operator the position and tendencies with regard to the tunnel axis. 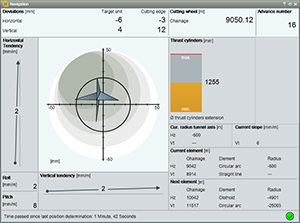 This allows vertical or horizontal curves to be easily and precisely controlled. The comprehensive information displayed ensures optimum control of the machine position and thus helps to maintain a uniform advance with small deviations from the tunnel axis. 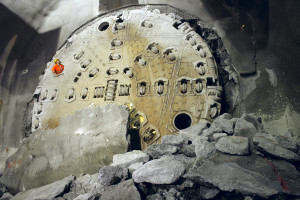 The tunnel boring machine may also be visualized as top or side views. Aerial photographs, satellite images, or drawings may be used as an image basis. This allows visualization of the project advance in configurable views and to detect critical situations graphically. Another option for visualization is to display the track chart which represents the position of all machine parts. TUnIS Navigation TBMLaser for EPB, mixed shields and hard rock TBMs.